In times gone by, the Wirral village of Burton was a thriving port on the River Dee, a busy market town and the venue for a three day fair. One of the only remaining links to this history is the church’s dedication to St. Nicholas who is the patron saint of mariners. The first stone church was erected on the site for the benefit of the families of the thirteen people recorded in the Domesday Book (possibly up to 65 people). The only remains of this early church are two Norman scalloped capitals from the tops of pillars which were discovered buried in the churchyard and now lie in the porch under the bell tower. The church had fallen into such a state of disrepair after many years of neglect that it had to be rebuilt. 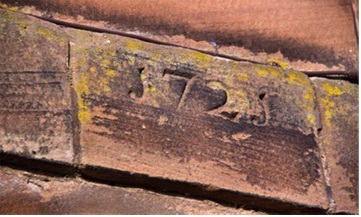 The church had again been neglected and extensive restoration was undertaken in 1554. 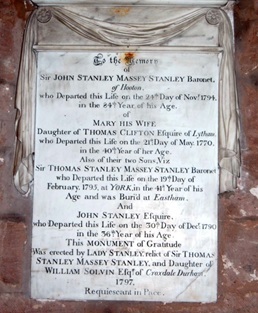 The only part of the earlier church to remain was the Massey Chapel. For more than 200 years, until the last of the direct line died in 1716, the Massey family of Puddington were the most influential family in the parish, and took responsibility for appointing the clergy of Burton, despite the fact that they were Roman Catholics. The Tower and nave of the church were rebuilt, thanks to the considerable fund raising efforts of the parishioners who appealed to other parish churches in England. The church has changed very little since this final piece of restoration apart from the chancel which was rebuilt in 1870 in memory of William Congreve. 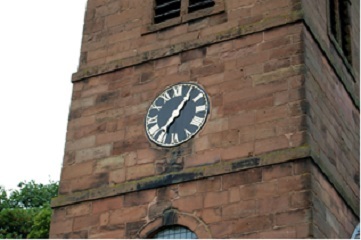 The clock in the tower face has only one hand, made in a time when minute hands were not needed. A glass topped case contains a little volume of the “prayers, meditations, etc” of Thomas Wilson, who was born in Burton in 1663. Thomas Wilson became the Bishop of Sodor and Man and in 1724 he founded a free school in Burton for the children of the parish. Although the school has moved to its current location in Puddington Lane, it still retains the name of Bishop Wilson. The carved wooden font cover in Gothic design is much older than the font. Memorials around the church tell of the history of both the villages of Burton and Puddington and the people who were involved in the life of the church. Stained glass windows by Charles Eamer Kempe grace the wall behind the altar, distinguished by his trademark - a small wheatsheaf in the bottom corner. 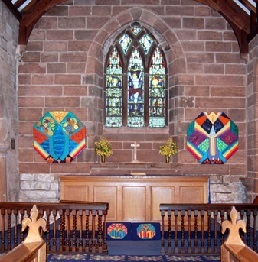 There are many examples of embroidery around the church; particularly striking are the two panels either side of the altar, created to celebrate the millennium.